In our letters we've indicated "Yablykangly" as border crossing, as I wasn't sure what's the proper town name to get to Khiva and took it from Google maps. Actually we've wanted to get to Nukus in UZ, but there were some reports that the closest border crossing between Konye Urgench and Nukus is temporarly closed. 2 days after sending the documents to Berlin I got a call from the embassy and a very nice guy (seriously, it was a very pleasant call!) asked me which boarder crossing he should put into the official visa form as the one indicated by me is in Uzbekistan. So, after a quick chat, he proposed he will just put Konye Urgench if we want to get to Nukus (apparently there was no issue with this one). After approximately 1 week our passports were sent back with 5 days transit visas. One of the nicest embassy experiences ever, to be honest! 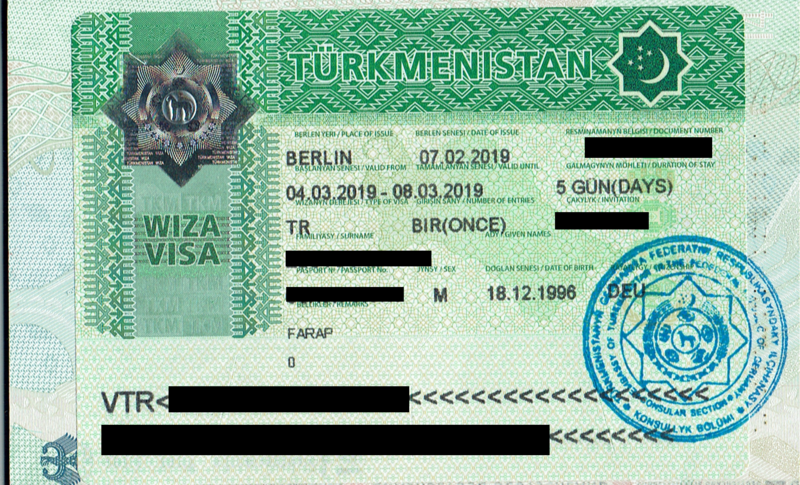 Somewhere on the internet I was told that foreign citizens living in Germany (like my French friend) need to hand in a registration certificate ("Meldebescheinigung" in German), but nobody at the Turkmen embassy asked for it. We gave all our documents to a very polite middle-aged embassy employee who is fluent in German, Russian and Turkmen. We had already talked to him on the phone prior to our visit to clarify some details, and he was very helpful. The atmosphere at the embassy is pretty chill. He even made a few jokes with the mailman who came in during our visit. We were told to call the embassy at the beginning of July to check if our passports were ready. We did so on Monday, the 3rd of July. The guy told us to call again on Tuesday. We did, and he told us to call again on Wednesday. On Wednesday nobody picked up the phone. However, on Thursday morning I received a phone call from another embassy employee who told us that are passports were ready. I picked them up in person a few hours later. In total, we waited 13 days (11 working days). Our transit visas are valid for five days, from Howdan to Konye-Urgench. I'm about to send my application to the embassy in Berlin. However, I'm not quite sure what to do with the "Name of the company director" and the associated signature field in the additional transit visa form. Did you guys leave that open or ...? Today I got the news via telephone that my transit visa has not been approved. Tough luck. I sent in all the mentioned documents for a transit from Azerbaijan to Uzbekistan in early October. At the embassy they can't give any reasons but they informed me that I can ask for a refund of 40€ (of the 55€) by mail. I applied for a transit visa on November 26th in Berlin, in person. (I'd actually gone the previous day but my forms were incomplete). I was asked to pay EUR 50 (their website says EUR 35 but I was told this is for Germans only - I'm British). They let me keep my passport and took a photocopy of the photo page and my visa to Uzbekistan; I also gave a printout of my e-Visa to Azerbaijan. I had a phonecall last Friday to say that I was successful and picked it up this morning (December 19th). Initially I tried to communicate in German but when they saw that I was British (and my German is dreadful), they spoke with me in English. Sidenote: the embassy is in Dahlem, so factor that into your travel time! X83 bus stops right outside and connects with S Steglitz on the S1 line. - bank account of the embassy to pay the fees is accessible after you ask for it per email. - fast processing can take longer than 14 days. For us it was a couple of extra days. - We only mentioned transit in all documents (including application letter, where we described our transit in detail), never anything related to visiting places. - We were very well prepared. Me and a friend, both German students, 22 years old, got our 5 days transit visa for march in Berlin today. We applied with the route from Moscow transiting via Istanbul - Ashgabat Airport (Flying in) - Farap - Uzbekistan to Tajikistan and got approved. 3. print the payment confirmation and fill out both the visa application form in German/Russian and the Russian questionnaire, I also filled out the English questionnaire but was told that I don't need this. Put a passport photo on both forms and also sign both. I, [name], hereby apply for a five-day transit visa. I will enter Turkmenistan on [entry date] by plane at Ashgabat Airport and leave Turkmenistan by land on [exit date] via the border point Farap towards Uzbekistan. My route is therefore as follows: Airport Ashgabat - Ashgabat - Turkmenabat - Farap. I land at the airport Ashgabat on [entry date] with a flight from Moscow (Russia) via Istanbul (Turkey). The reason for the transit is to reach Tajikistan with another transit through Uzbekistan. The visas for Russia and Tajikistan can be found in the appendix, Turkey and Uzbekistan are visa-free. I kindly ask you to issue the transit visa as soon as possible during the express processing time. 5. include a passport copy and a copy of your visas of the country from and where you are going to, we gave them the Russian visa and the Tadjik E-Visa as Turkey and Uzbekistan is visa free for German citizens. Explaining that Uzbekistan is visa free might be also enough. 6. if you want to apply personally, prepare for the consul being not there or busy for no reason even if its between 9:00 and 12:00. In the embassy you give the documents to the consul, there is no other worker processing it. The consul is friendly but very slow and speaks only English and Russian, no German. At the first try, the consul was busy and a different embassy worker told me to come again at 14:00. When I returned at 14:00, the consul answered at the front door that I have to come again the next day before 12:00 because it is not possible to apply after 12:00. At the second try, I got into the embassy, my documents were checked but refused because we didn't transferred the money yet, the photo and signature at the Russian questioner were missing and we wrote one application letter for us both. At the third try, everything was checked again. The application has been approved and sent to the Ministry of Foreign Affairs Turkmenistan. After 8 days I surprisingly got a call by the consul. He informed me that the visa is ready and I can either get it at the same day or in the end of next week. When I got to the embassy and rang, a woman came out of the building and just gave me the passports. Interestingly, only the exit point Farap is written on the visa, no entry point.